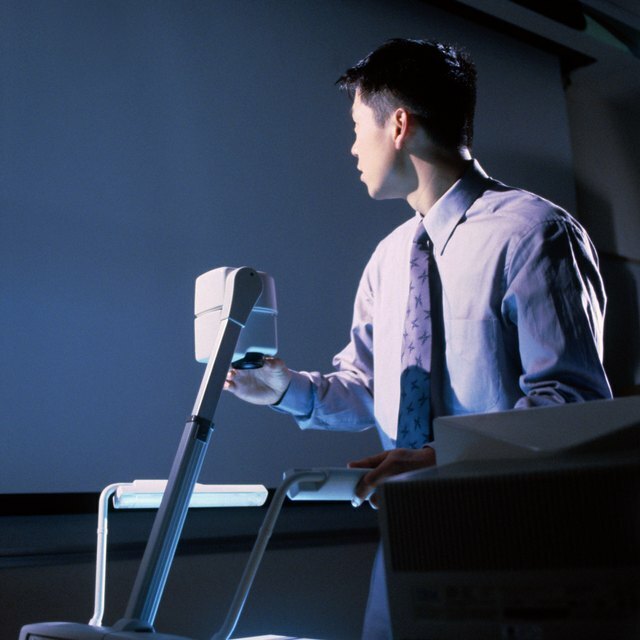 How Do I Use an Overhead Projector? The first type of overhead projector was the episcope, replaced in the 1940s by the earliest modern devices. Only after educators adopted the overhead projector did it truly come into its own. The earliest incarnation of overhead projector was the episcope, invented at the start of the 20th century. The concept of projection with “magic lamps” was described in the 1911 Encyclopedia Britannica. The opaque projector shone bright light down onto a non-transparent object and a combination of mirrors or lenses projected the image onto a screen. Because more light was required than with an overhead projector, projected materials could be damaged, limiting the use of the device. At first opaque projectors barely climbed out of the realms of children's toys, though artists did use them for enlarging images. Gradually, however, they were adopted for lectures and presentations. How Do I Use an LCD Projector? According to Henry Petroski in "Success Through Failure: The Paradox of Design," in the 1940s the police and the army used an early version of the overhead projector. These first machines used already-existing slide projector technology to project images onto a large screen. Roger Appledorn worked as a research scientist for 3M, founded in 1902. In the 1950s, 3M introduced the thermo-fax copying process. The company was known to encourage experimentation among its staff, and Appledorn designed a machine to project writing from clear film. While 3M liked the idea and developed it into the first overhead projector, the idea lacked support in the marketplace. Appledorn went out himself to approach teachers, who saw its potential enough for the product to take off. 3M and Buhl Industries were among the first major manufacturers of overhead projectors. Companies were slow to adopt the technology because hand-written notes were considered too informal. Only when photocopies became available was that particular hurdle overcome. It was in the education sector that overhead projectors saw the most growth. In the 1980s teachers started using overhead projectors to project moving images using LCD screens. The first such projectors were monochrome, but color versions started to be available by the end of the 1980s. Today, computer technology is rapidly replacing overhead projectors, especially since presentation slides can now be projected directly from software such as Microsoft PowerPoint. LCD projection was generally blurry and computers offer a better image for a more sophisticated audience. Additionally, even the newest overhead projectors are large and unwieldy. Still, overhead projectors are standard equipment in schools and many businesses, and the industry shows no sign of failing.